Some of Well Rounded Birth Prep's happy graduates. "As my husband and I are excitedly anticipating the birth of our 5th baby, I ventured into unfamiliar territory and decided to look into a natural birth. I've spoken to moms before who had non-medicated deliveries and honestly, I didn't see the point. However, after 4 inductions, 4 epidurals and 4 excellent experiences, I started feeling a pang ... 38 years old... who knew, this might be the last child? My desire to experience a natural childbirth, unscheduled, waking up in the middle of the night, the wonder of a woman's privilege, the inexplicable reward of true labor - I want to experience that. 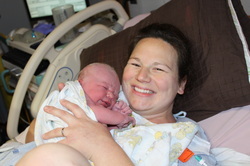 "I started out a little anxious about the class since I didn't want to be pushed into anything that made me feel uncomfortable or to be introduced to some granola, feel-good, new-agey reason for experiencing natural childbirth. I also didn't want to feel that if I didn't choose this direction, I would be fraught with guilt and left branded as a wimpy mom! I really desired to be educated on my options and to be convinced of the benefits of natural childbirth rather than the evils of standardized medical care. "From the few conversations I've had with Sarah, I learned that she was passionate and well-informed. When she received her certification, I knew that she was the one for the job. "Boy, my husband and I were pleasantly surprised. In a 6-hour session that flew by, Sarah not only enlightened me (and my physician husband) on so much about childbirth that you would think this wasn't my 5th! With statistics and medical reports backing rational and reasonable explanations, Sarah helped us as we prepare a birth 'preference' list. Sarah went through the entire class as if she had been doing this for years! Her presentation was passionate, thorough, professional and insightful. She gave us much food for thought and really even put me at great ease regarding the actual mechanics of childbirth. I realized that the more I understood what was expected and normal, the more I could relax and look forward to holding my daughter in my arms! "I was pleased that it wasn't a session on hospital-birth bashing (as I've opted for a hospital birth) but it was an informative and equipping session preparing me for a safe, joyous and God-honoring life experience. 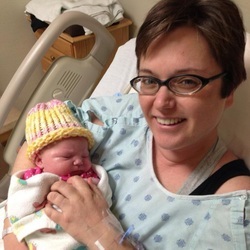 "Regardless of your decision for a home birth, water-birth, birthing center, hospital birth, doula, midwife, OBGYN, I highly recommend the "Well-Rounded Birth Prep" class with Sarah DeGroff. Regardless of how things go in God's wisdom during the actual delivery, I believe that my husband and I are now better educated than ever to make a healthy and good decision. We have moved from cautiously exploring to deliberately choosing natural childbirth because we are convinced of it being the right decision for me and my unborn daughter. 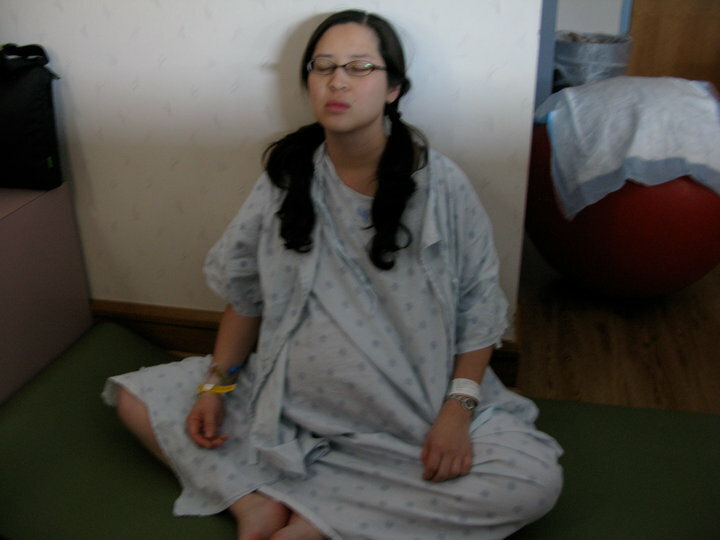 "I used breathing techniques thru contractions and just focused. I couldn't believe how good I felt until the very end! I was chatting on the phone with my girlfriend and updating my facebook status at 9 cm. Not kidding!" "During labor, I used all sorts of different positions as well as the ball and leaning against the bar on the bed. 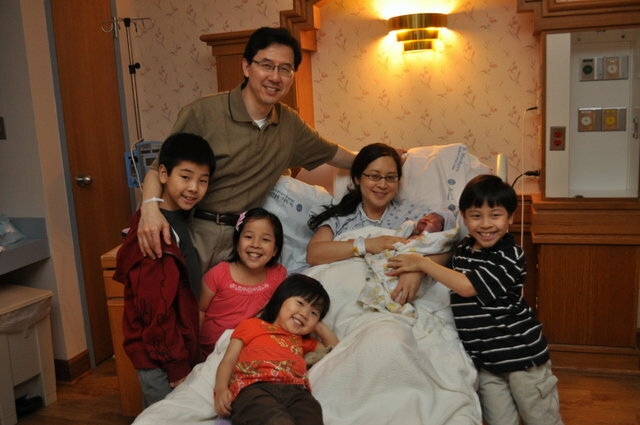 I was not only comfortable during labor but very relaxed and almost giddy with excitement!" "My beautiful family. Thanks Sarah!" You have a wonderfully informative site. Thank you for all the work you put into it. 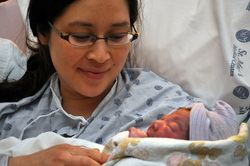 I gave birth last Friday to a 8.13 baby girl via VBAC at one of the highest c-section hospitals in the state. My doctor was in full support but my 'community of moms' who have had RCS were very skeptical. I just wanted you to know that I used a lot of your links to keep me focused on the kind of birth I wanted and to keep the doubt at bay. Thank you.